This large (1,100 sq.ft) 2 bedroom apartment is furnished to a very high standard. In addition to the 2 bedrooms two more people can be accommodated on the extendable sofa in the open plan living room, which includes an enclosed glass front fireplace.This apartment also has two elegant bathrooms with bathtub, fully equipped kitchen, balcony, telephone and cable TV. The heating and hot water availability is individually controlled by the tenants. The kitchen is fully equipped with all necessary cutlery and appliances including refrigerator, furnace, electric plates, microwave oven, electric kettle, toaster, washing machine. In addition to the 2 bedrooms 2 more people can be accommodated on the extendable sofa in the living room, in front of the fireplace. The kitchen is fully equipped with all necessary cutlery and appliances including refrigerator with freezer, electric cooker with oven, microwave oven, electric kettle, toaster and washing machine. Notes on accommodation: This apatrment was built in 2006 and is finished to a very high standard. The apartment is located only 90m from the ski lift and ski school and next to the green ski run which you can be skied without using the ski lift. The complex has a bar and restaurant and threre are several other bars and restaurants within walking distance. Outside: Located on the ski slopes. Ski in and ski out. Cleaning / Towels / Linen / Maid service: Apartment are cleaned and towels and linen are changed twice weekly. Nearest airport is Plovdiv at 85km (about 1½ hour drive) . Sofia airport is 240km (about 3 hours drive). New Ryanair fights Stansted to Plovdiv. Day trips can be taken to Plovdiv or the nearby town of Smolyan. The famous Bachkovo Monastery is 1 hour away. A large number of various shops are available at the resort. A shopping centre is available in the area of Perelik and Murgavets hotels. There are several cashpoints available in Pamporovo. 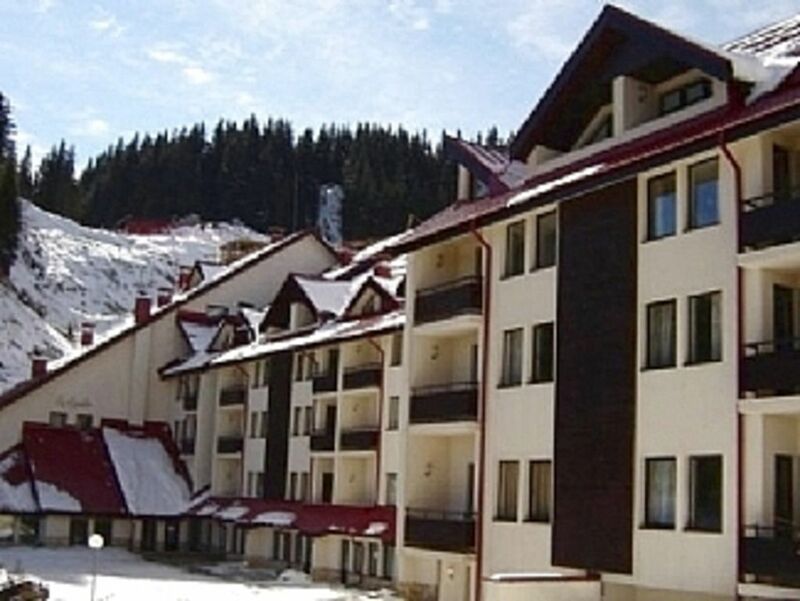 Pamporovo is a modern ski resort in the heart of the Rhodopi mountains. It is the most southern skiing resort in Europe and the sunniest Bulgarian mountain resort. It has wonderful snow throughout the whole season (18 December - 7 April). Pamporovo is situated 1650m above sea level at the foot of peak Snejanka (1926m). Pamporovo has an exclusive climate featuring a soft winter with about 120 sunny days during the skiing period. In your spare time you are welcome to visit our wellness-center. It features fitness gear, sauna, steam-bath, Jacuzzi and massage. Fresh, packed and tinned food, drinks and grocery are available at the food-store on the premises. Booking Notes: A non-refundable deposit of 20% is required on confirmation of booking. The balance is payable 8 weeks prior to the beginning of the rental period. Payments can be made via PayPal or by bank transfer and account details will be supplied on confirmation of booking. Changeover Day: Generally Saturday but can be flexible.